Physics professor Robin Erbacher, wearing a slice-of-pumpkin-pie hat, anxiously awaits her run with her department’s team in the Yolo Food Bank’s Thanksgiving Day fundraiser. See the team’s results below: how many people joined the team and how much money they raised. We’ve got ideas on where to give (Toys for Tots, Mercer Clinic Holiday Pet Baskets and food drives), and ideas on what and where to buy (in our Holiday Gift Guide, and at two sales this week at UC Davis Stores), and a report on the fundraising success of the physics department team in last week’s Running of the Turkeys. Plus, we have recommendations for the inner you: a Holiday Self Care Workshop and the staff and faculty Well-Being Ticket Deal for December: Handel’s Messiah, performed by American Bach Soloists. • Toys for Tots — Mail Services is once again helping out the Marine Corps Reserve on this annual drive, so you know it’s easy: Just bring new, unwrapped toys for ages up to 16, and leave the toys with your outgoing mail or in the blue bins around campus (see a list of locations). Donations can be made until Friday, Dec. 8. The Marine Corps Reserve will distribute the toys in Woodland during the weekend of Dec. 16. For more information, send an email to mailservices@ucdavis.edu. All cuddled up in sweater and owner's arms. • Mercer Clinic Holiday Pet Baskets — Veterinary Medical Teaching Hospital staff members founded this program 22 years ago, and most of the original team is still at it (including retirees) — on an entirely volunteer basis. They raise money to pay for toys and treats, food and brushes, and coats and sweaters for pets belonging to homeless people. The distribution takes place at the Mercer Clinic for the Pets of the Homeless, which also has a UC Davis connection, as an all-volunteer project of veterinary students, preveterinary undergraduates and veterinarians. Contributions to Mercer Clinic Holiday Pet Baskets, including coats and sweaters, can be made online or by check. All donations are tax-deductible. For more information, contact coordinator Eileen Samitz by email, emsamitz@ucdavis.edu, or phone, 530-756-5165. Read earlier coverage: "Warm Up the Holidays for Mercer Pets." • Santa Paws — This is another way to help the Mercer Clinic for the Pets of the Homeless, and get a photo of your pet with Santa at the same time. Veterinary students hold this photo session annually at Arden Animal Hospital, 1823 Fulton Ave., Sacramento. This year’s event is scheduled from 9 a.m. to 4 p.m. Sunday (Dec. 10). Suggested donations are $25 for digital photos and $5 for additional print copies. All donations go toward supporting Mercer clinic operations. • Swipe Out Hunger — Swipe your meal card or credit card, or make donations by cash or Aggie Cash at Student Housing and Dining Services-operated retail locations (including the Silo and South Silo), to support Aggie Meal Share, the ASUCD Pantry and the Yolo Food Bank. This year’s Swipe Out Hunger campaign has a fundraising goal of $10,000 and runs until Friday (Nov. 30). • Stuff a Bus — Unitrans, the campus-city bus system, and Nugget Markets will hold a holiday food drive from 9 a.m. to 3 p.m. Saturday, Dec. 9, in the parking lot of the Nugget store at 1414 E. Covell Blvd. (at Pole Line Road), loading the food into a vintage double-decker bus. “Children and adults alike are invited to enjoy the view from the top deck as they drop off their food donations,” the organizers said. Donors also will have the opportunity to spin a prize wheel, and the first 50 donors will receive free Nugget canvas bags and 10-ride Unitrans passes. The collected goods will be delivered to the ASUCD Pantry and the Yolo Food Bank. The food drive organizers are asking people to especially consider the donation of canned vegetables, canned fruit, canned meat, low-sugar cereal, peanut butter, whole grain pasta, rice, canned or dry beans, 100 percent fruit juice and shelf-stable milk. Professor Lloyd Knox, lower left, and about a third of the Running Coupling Constants team that assembled for this year's Running of the Turkeys. 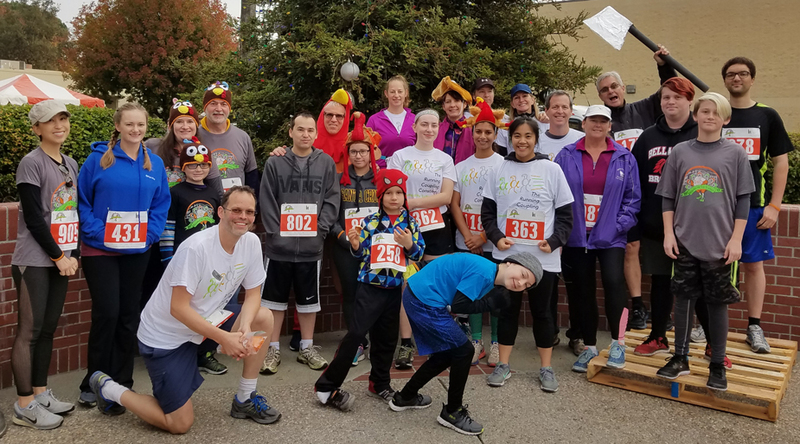 With a roster of 59 people, the Running Coupling Constants — based in the Department of Physics but open to anyone — had more participants than any other team for the second year in a row in the Running of the Turkeys, a Thanksgiving Day fundraiser for the Yolo Food Bank. Professor Lloyd Knox also reported that the team “blew well past” its fundraising goal of $4,500. Counting registration fees (100 percent of which go to the food bank) and donations (including matching funds from Knox and faculty colleagues Richard Scalettar and David Wittman), the team brought in $5,700. The workshop is scheduled from noon to 1 p.m. Monday, Dec. 11, in 130 Hoagland Hall. Sign-ups are being taken online, and the organizers stressed: Space is limited. Professor Thomas serves as the ABS artistic and music director. December’s deal for is for the American Bach Soloists’ presentation of Handel’s Messiah at 4 p.m. Sunday, Dec. 17, in Jackson Hall at the Mondavi Center for the Performing Arts. The Staff and Faculty Health and Well-Being Program and the Mondavi Center are partners in the once-a-month ticket deals, whereby all staff and faculty can buy one or two tickets for $10 each to selected shows. Each deal comes with a 14-day window to buy tickets, always from the 1st to the 14th. For the December deal, use promo code ABS17 when buying tickets online. Mention the deal when buying tickets in person or by phone, 530-754-2787.